"It crawls from the shadows to claim our Light in the name of Crota." 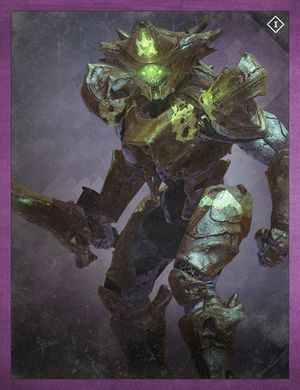 The Hand of Crota is a Hive Knight, and one of the targets in the Disciples of Crota Quest. One can be summoned in the Lunar Complex by killing a Servant of the Hand (a special Level 22 Thrall). He can be tough for Level 30 Guardians, as he spawns in a small space on Patrol, wields a devastating Cleaver, and can withstand a Hunter's Golden Gun. The best thing to do is wait for the Golden Gun to recharge for a Hunter, hit him with a shot, and then finish him with another weapon. An Exotic Sword can finish him off with one super attack.